When life gets crazy, make brownies. Life around here has definitely been crazy, you might have noticed the absence of posts. Well, to comfort myself I made a fudgy style of brownie and felt I should definitely share. Accept my chocolatey, tasty, less than guilty apology? Wait till you see the secret ingredient…don’t let it turn you off. My husband, the surly dwarf, didn’t even notice. Definitely try it. Spray 13″x9″ pan, preheat oven to 350F. Combine sugar, cocoa, flour, and baking powder. Add egg whites, pumpkin, coconut milk, and vanilla. Stir until moistened. Pour into pan and bake for 30 minutes. Cool completely before cutting into 24 squares. Makes 24 brownies. 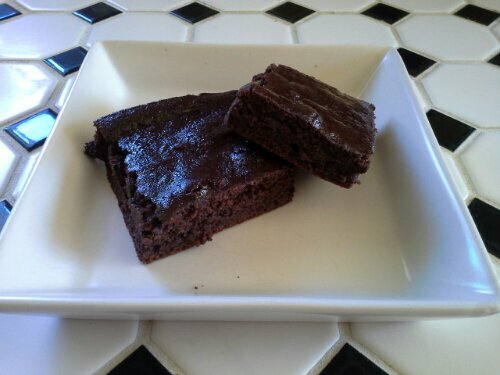 Each brownie contains 58 calories, .9 gram fat, 14.5 grams carbs, .7 gram fibre, 1.8 grams protein. Yeah, I know. I had to double check, I was so surprised. Definitely a go to brownie for those chocolate comfort cravings. This entry was posted in Comfort Foods, Craving Buster, Dessert, Snack and tagged cocoa. Bookmark the permalink.